This article is perfect for pet store owners, veterinary clinics, adoption centers, animal trainers, pet caretakers and many other businesses or organizations. Below you can find some of the best choices for animal and pet oriented websites, which will save you time from looking yourself. 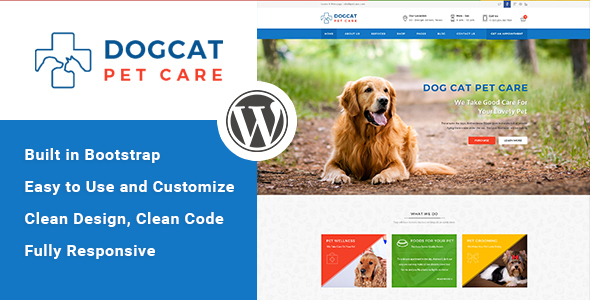 PetCare is a modern and professional theme suitable for multiple purposes, even if it was mainly designed to enrich and enhance pet-oriented websites. It can also be used to open an online pet store because it is fully compatible with WooCommerce. Some of this theme’s features are: responsive design, multiple customizable design elements, shortcode panel, logo, font, and colors management. 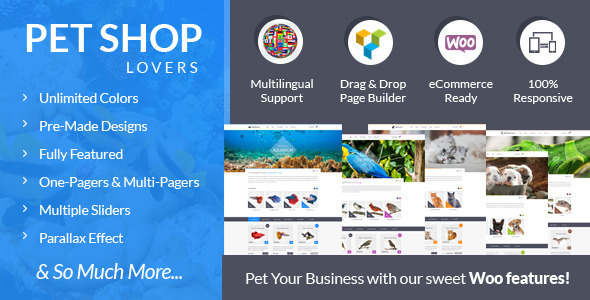 PetCare includes Visual Composer and Layer Slider for free. It is not hard to guess which niche this theme addresses. LovePet has a minimal and clean design specially created for animal care websites. Anyone can be an expert with LovePet, whether you choose one of the 8 homepage demos or create a stunning layout yourself. You can personalize it easily to your taste and vision with the help of Visual Composer, which comes bundled with this theme. In addition to all these incredible features, once you get LovePet, you benefit from lifetime support and updates. Green Rescues, like the name suggests, can be used for more than just pet-related websites. It was mostly designed with environment protection in mind, but its design is so flexible and creative, it had to be included in this list. Green Rescues comes along with various premium plugins like Revolution Slider, Visual Composer, Essential Grid and PO Composer. So even if you don’t like the awesome pre-built demos it comes with, you can easily use these plugins and the advanced admin panel to create something your own. Design your way to a better world! Even if you are trying to build a pet-related website, it has to be modern and professional, and Pet Club is the greatest choice for that. It was designed for veterinary clinics, pet stores, adoption centers, and more. With 5 unique homepage demos at your fingertips, it’s hard not to find one to your liking. The theme developers also are adding to their demos constantly. 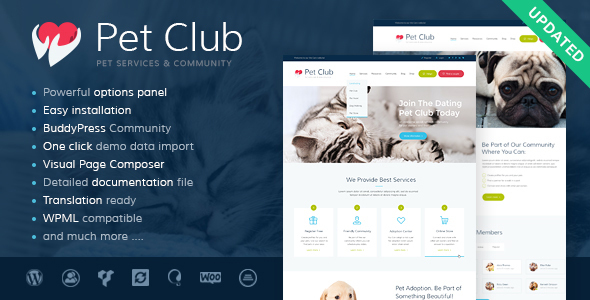 Pet Club is compatible with the most popular plugins that you will most likely need to help build your website. This theme is perfectly adaptable, versatile and highly customizable. If you are looking to create a pet-related website, get Pet Club. Anima is an eye-catching and professional premium WordPress theme perfectly suitable for charity, fundraising, events organization purposes. Anima is built to meet and surpass functionality and design expectations and requirements. Anima is compatible with Visual Composer, Contact form 7, MailChimp, Slider Revolution and WooCommerce. One-click demo data is included and the theme options panel is powered by WordPress’ Customizer. Animal is a fine fit for any pet-oriented website! 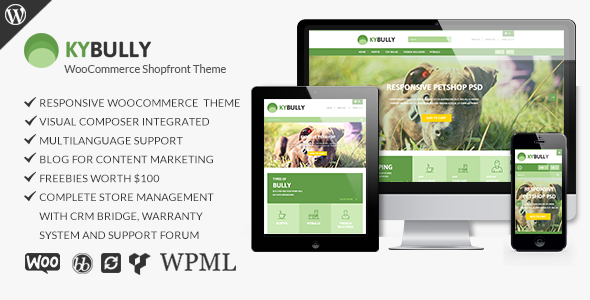 Kybully is a WooCommerce shopfront WordPress theme fitted for pet shops. Kybully it has boundless potential and it is fully responsive by using a mobile first concept. It comes with Revolution slider, 3 header variations, wishlist and compare features, different footer variations, mega menus, and multilanguage support. Break the mold with Kybully’s stunning page layouts, the powerful admin panel, and unlimited color options. 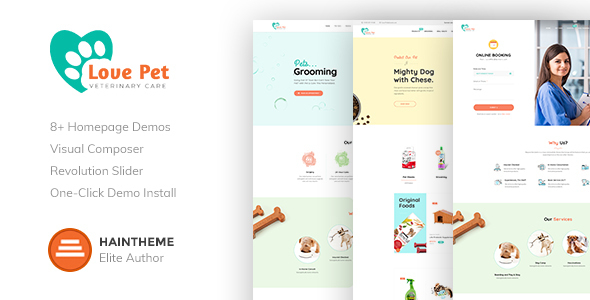 Pet Store is one of the best-selling themes in the pet niche on Theme Forest because it focuses on product presentation and the shopping functionality. If you want to build a pet store, this theme is a great choice for you. It is fully compatible with various popular plugins, among which is WooCommerce. You can personalize the theme through the theme customizer and make sure it stands out in this tough market. For those that get tangled in the theme’s features, Pet Store offers some incredibly useful video tutorials for its clients. Get going with Pet Store! 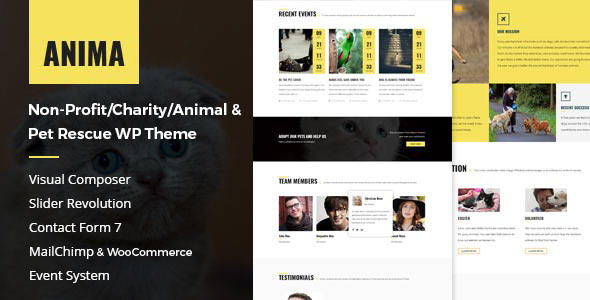 Pet World is a well-designed WordPress theme dedicated to animals and animal lovers. It comes with a responsive and mobile-friendly design and it is also retina ready to look just as beautiful on any type of device. Save over $70 because Pet World comes in a bundle with Visual Composer, Revolution Slider and Ultimate addon for Visual Composer. Choose between a classic homepage, a homepage with a shop included, a pet sitter homepage or a services homepage, to showcase your most important features beautifully. Whether you are looking to build a website for pet caretakers, animal adoption centers, animal trainers, or a pet store, Pets Club is the ideal choice for you. Pets Club is fully compatible with WooCommerce so you can also start an online shop for pet products. Create the look in the theme’s demo with a single click and if you wish to diversify your homepage or any page, just use the amazing premium plugin Visual Composer, which comes bundled with this theme. Pets Club’s design is really cute and engaging and no matter the changes you make to it, it will look incredible. Feel free to experiment with it! 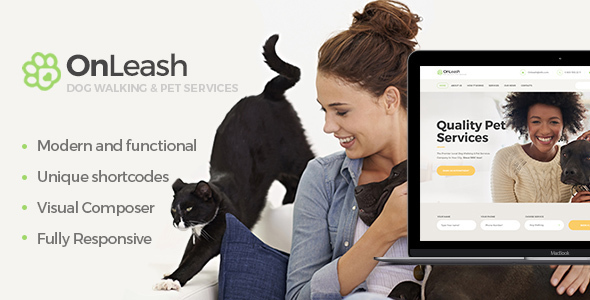 OnLeash is a highly customizable modern premium WordPress theme packed with incredible features to help you make the best out of your pet-related website. It can easily be used as an online pet store thanks to the compatibility with WooCommerce. OnLeash has a colorful and interactive design being very easy to use for visitors and engaging. It can be used on any browsers and all devices whether it’s a phone, table, or desktop. Play with its design by choosing different page layouts, headers, footers and using the dozens of shortcodes it comes with. 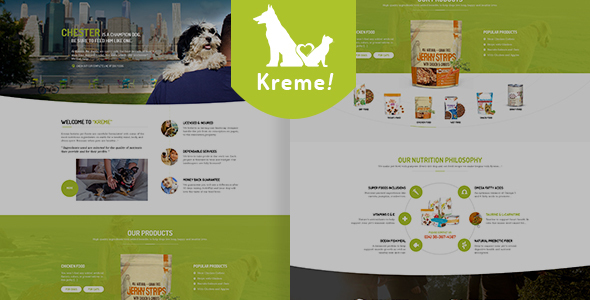 Kreme is the ideal choice for online pet stores. With already two pre-built demo homepages, launching your pet-related business has never been easier. Using the incredible drag & drop functionality of Visual Composer you can create various unique pages to showcase your products perfectly. The theme is fully compatible with WooCommerce and it has an awesome testimonials section. Let your visitors know when there is a sale with Kreme’s cool countdown option. Pet Grooming is a visually stunning premium pets WordPress theme which can be used for various purposes. This theme’s simple yet beautiful style will make your pet-oriented website stand out from the crowd. 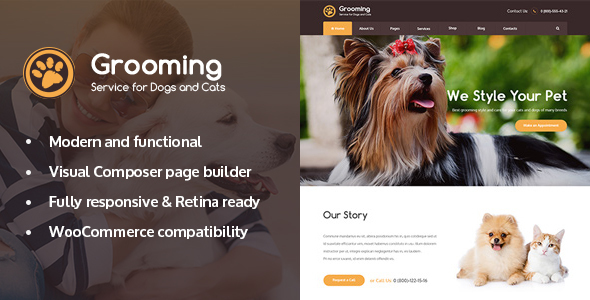 Pet Grooming is fully responsive and retina ready, comes with a detailed documentation, various homepage layouts, it is SEO optimized and much more. Pet Grooming is a premium quality WordPress for pets and animals, so use it now! 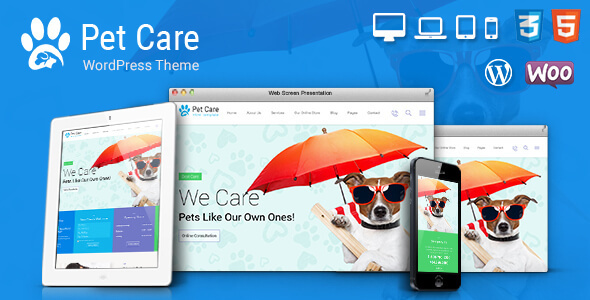 Pet Care is a modern, flexible, top-quality WordPress theme for pet-related websites. The theme incorporates 4 pre-made skins for this niche, as well as 28 custom page layouts. Pet Care has an integrated online booking system to offer the user the ability to book appointments online. You do not have to be an expert developer to set up and launch a website. Pet Care provides you from the start with the tools necessary to open and own a successful pet store or pet salon. Feel free to customize your site’s typography and colors to make it your own. Paws & Claws will surely brighten your day with its colorful and cool design. In addition to its design, Paws & Claws is a reliable toolkit to help you build an incredible pet-oriented website in the shortest time. It doesn’t matter your previous experience with WordPress and themes, Paws & Claws makes things seems simple with its intuitive admin panel, various pre-built layouts and shortcodes to set up a website without breaking a sweat. Try it today! 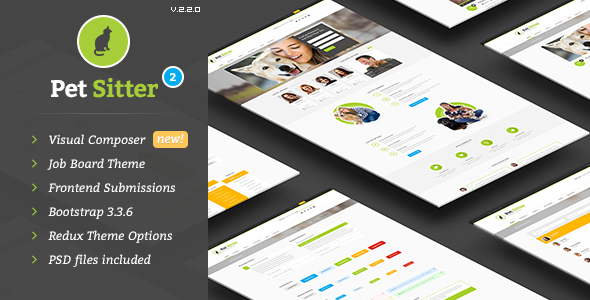 Winner of the Envato ‘Most Wanted’ award, Pet Sitter is a beautiful theme with incredible functionality suitable for various pet oriented sites. With Pet Sitter, you are sure to attract visitors and potential clients to your website. Using the Redux Theme Options you can create a user friendly and welcoming website, without knowing any coding. You can easily create something that matches your business and taste with the multitude of options and features this theme offers. Equestrian is a beautiful and elegant theme ideal for horse lovers. Equestrian provides the perfect platform to design and creative unique and sophisticated websites for equestrians. The demo content is included along with an extended documentation and reliable customer support. It is SEO friendly, optimized for speed, translation ready and 100% responsive. It comes in a package with Visual Composer, Revolution slider, and layer slider, which saves you time and money. 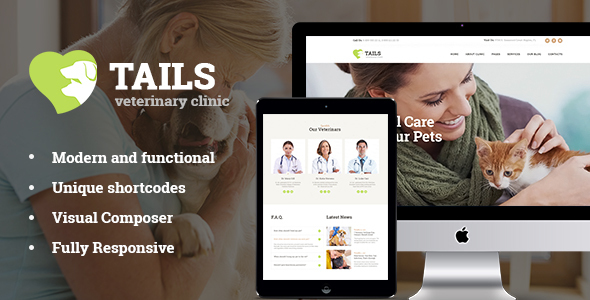 Vets is a lovely WordPress animal theme that fits an array of animal healthcare related websites. It is simple, efficient and gets your point across without unnecessary distractions. You can design your own theme skin with the admin panel and the page builder SiteOrigin or go with the pre-built demo to save time. Either way, with Vets you are certain to have a beautiful and clean website. 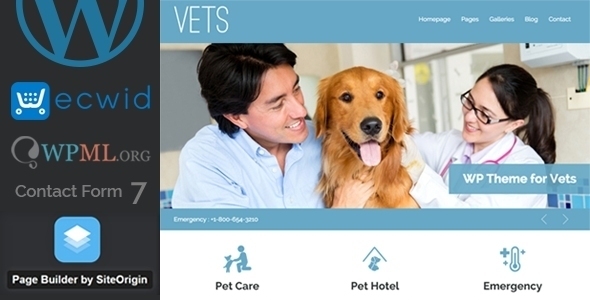 Vetcare is a professional, clean premium theme designed and developed for pet care institutes. Its modern design will showcase perfectly your services, team members and price ranges. Vetcare can be installed easily and in a few minutes you can have a demo layout to work on, thanks to the one-click demo install feature. It includes full appointment and booking management, as well as creating different calendars by departments or services. Try this intuitive and efficient theme today! Take your visitors to an awesome experience with Pet Rescue. Even if its name suggests otherwise, Pet Rescue is a versatile theme. Not only it can be used for pet-oriented businesses and websites, but it can also be used for nature movements, fundraisers websites, and so much more. It is so versatile because it comes with special features from the Events Calendar plugin and PayPal donation functionality. Pet Rescue also comes with an incredible collection of shortcodes that you can manage through its visual interface. Pet Rescue challenges your creativity! Happy Pets allows its users to focus on what is important – the content. 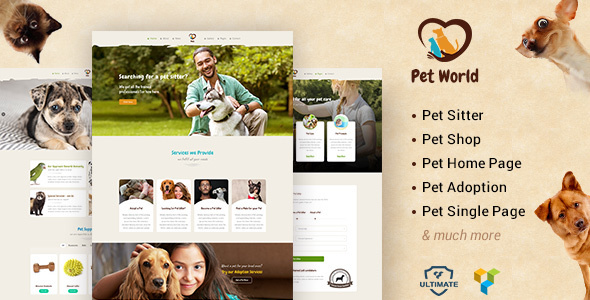 With a clean and attractive design, this theme is ideal for any pet-related website. 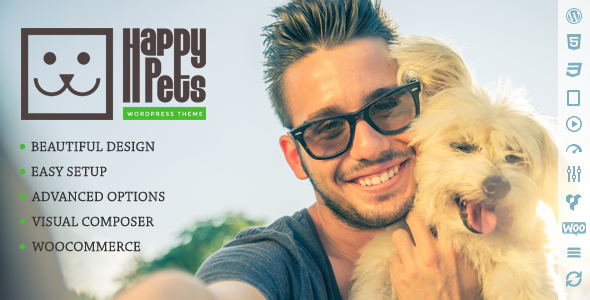 Happy Pets is bursting with cool and useful features that will keep your visitors engaged and focused on the content. Build your perfect pet website using cool features like the advanced theme panel, drag & drop visual composer page builder, revolution slider, gallery and shortcodes. 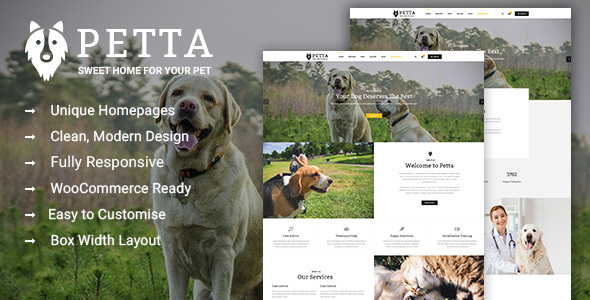 Petta is a stunning and completely responsive premium WordPress theme suitable for pet related websites. Its great design works amazingly well on mobile devices and computers. At the moment, Petta comes with only 2 prebuilt homepages, but they are updating and improving the theme constantly and they promise more. It also offers a variety of blog pages, event and gallery pages, and shop pages to choose from. Petta is well documented with text and video tutorials, but you will hardly need it, because the theme panel is intuitive. Tails is a multipurpose theme with a clean, beautiful and minimalist design. It can be used from simple pet blogs to online pet shops and many other choices in between. It is an ideal theme for beginners or people who need an easy and fast set up. Tails offers great customizations features to make the site your own. From different layout, header and footer styles to custom widgets and shortcodes to make the most out of it. Tails is versatile and compatible with popular plugins. It is a great choice to take your pet-oriented website to the next level. 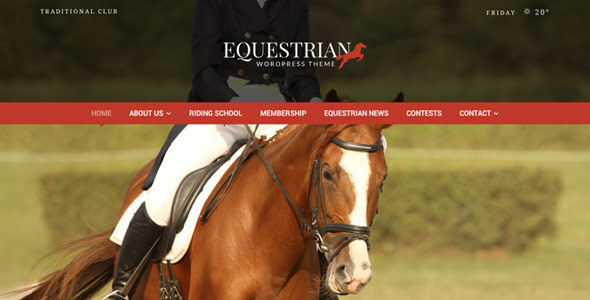 Horse Club is a premium theme eye-catching design that can facilitate the creation of any kind of equestrian website. 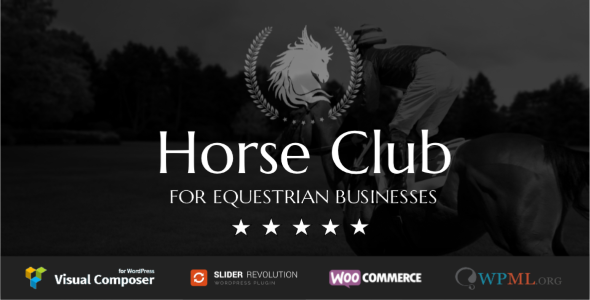 Horse Club brings all the attention to where it truly matters – your content. You don’t need to worry about knowing code or having any previous experience, because this theme is straightforward and effortless to use. If however you get stuck, there are awesome tutorials to help. Explore Horse Club’s 3 unique demos and and select the one you like best, or simply create your own layout with Visual Composer. 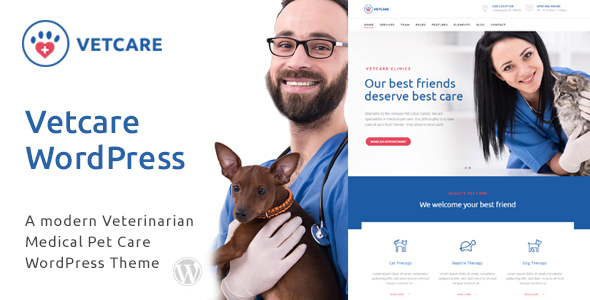 Pet Care is a premium pet and animal WordPress theme built in Bootstrap with a simple and clean design. It is fully responsive and cross-browser compatible. Choose one of the two homepage variations to start building your website and then use the theme panel to customize your theme and achieve impressive visual results. It also features cool CSS3 effects and animations to make it stand out even more. Pet Kennels is a charming and fully responsive WordPress theme. It is also multipurpose and thanks to its pre-built 10 demo homepages you can use for multiple purposes like animal shelters, pet health, animal trainers, and dog and cat caretakers. This theme is easy to customize and all its components are ready for you to play with. In short, Pet Kennels makes things simple for you while also allowing you to be creative. RescuePress is a premium WordPress theme focused on those working for the wild life community. It is fully multilingual and support RTL so you can reach more people. RescuePress comes with 2 pre-made homepages, 2 blog layouts, and multiple gallery pages. Pre-define parameters and customize the theme with the admin panel. With the help of this stunning theme, you can reach more visitors and invite them to join your cause either through donations or volunteer work. Try RescuePress and make a change in the world. 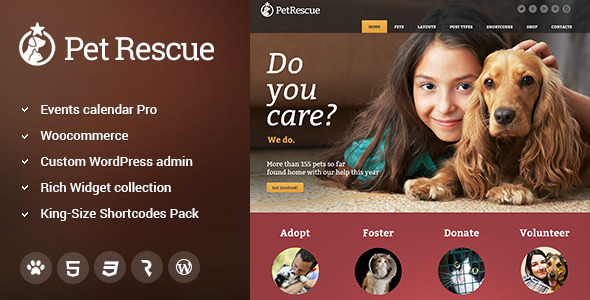 Rescue is an animal shelter premium WordPress theme built with a sole purpose: the adoption of animals. Rescue is the only theme integrated with PetFinder, which makes it incredible easy to sync your PetFinder account with the theme. Rescues’ design is simple, yet aesthetically pleasing and it is capable of displaying its content in any language thanks to the inclusion of the translation file. If you are looking for a theme designed for rescue shelters, then PetFinder is for you. 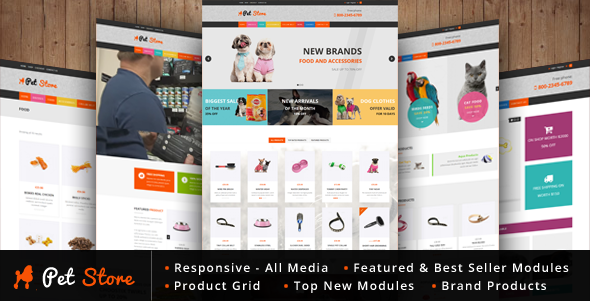 Designed and developed by an Elite Author, Pet Shop Lovers is a pixel perfect, responsive theme. Choose the layout that fits the best from the 12 stunning homepage demos and the 4 intro effects. Personalize the site with a unique combination from the 30+ navigation and header options. Make it unique and modern by using the parallax effect and the ken burns effect. The possibilities are endless with Pet Shop Lovers because it boosts at the seams with incredible features. Animal Care is a well-crafted and put together WordPress theme capable of lending itself as the perfect platform for pet-oriented websites. Animal Care is qualified for the niche it is competing in. Some of its amazing features are: unlimited sidebars, shortcode manager, over 100 Google fonts, widget ready, theme options and panel, various custom widgets, and beautiful galleries. It also comes with a detailed documentation and the theme was tested on all major browsers. Pets and Vets WordPress theme has a truly unique cartoonish design that will definitely enchant your visitors’ visual senses. The hand-drawn illustrations will surely keep them entertained and trigger passionate conversations. In addition to the unique style, Pets and Vets also comes packed with amazing features such as: translation ready, highly customizable, responsive, and WooCommerce compatible. What is awesome about this theme is that the artwork is included and you can easily make changes to it, plus they release new updates with animals and holidays specials. With this, we wrap up the list for the best animals and pets WordPress themes. Feel free to check them all out and do tell us if you found the perfect one for you!